Selecting the correct size compressor is vital to the unit’s performance, reliability and longevity. 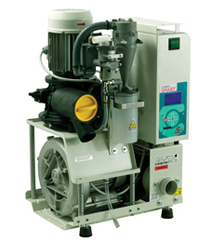 Cattani compressors are an oil free compressor that provides clean, dry air. They are a reliable and durable product that comes with a 5 year warranty. Cattani have a large range of compressors to suit your surgery requirements, from 1 to 16 chair surgeries. Acoustic options: All Cattani compressors can be supplied with an acoustic hood or an acoustic cover which reduces the noise levels by approximately 10 dB (A). Turbo Smart is a variable speed suction system that automatically adapts to the surgery requirements. As you lift a suction tip the unit responds by increasing its speed, hang up the tip and the Turbo Smart slows down. The Turbo Smart system is not only a powerful suction unit with high airflow; it also monitors the vacuum level, and automatically responds to any change in the use from the surgeries.